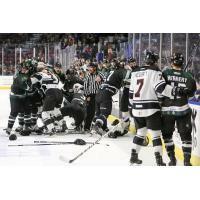 West Valley City, Utah - The Utah Grizzlies can clinch a postseason bid for the 11th time in 12 seasons with a victory on Monday night against the Rapid City Rush in the final game of a 6 game series and 3 game homestand. It's a Maverik Monday where tickets are buy one get one free when you show your Maverik Adventure Card at the Maverik Center box office when purchasing tickets. Face-off is at 7:00 pm. A big crowd of 9237 were on hand at Maverik Center on March 16th as the Grizzlies won 5-2 behind 2 goals and 1 assist from Mike Economos and 1 goal and 1 assist each from Teigan Zahn and Mitch Maxwell. Zahn got a Gordie Howe Hat Trick as he also had a first period fight for Utah. The Grizzlies captain was a plus 4 on the game. All 3 of Zahn's goals this season have been third period goals. Last Saturday was Military Night Presented by Mark Miller Subaru, where the Grizzlies were wearing specialty jersey's that were auctioned off after the game. A total of $13,425 were raised during the live auction. Forward Ryan Walters scored his 300th professional point on Saturday as he got an assist on the Grizzlies 5th goal of the game. Walters has 16 goals and 22 assists this season. Joey Ratelle was added to the Utah roster and played in last Saturday's game. He had 3 shots on goal for Utah and got in a first period fight. After the Monday night game, the Grizzlies begin a 7 game road trip with games this Friday and Saturday against the Allen Americans. Face-off both those nights is at 7:00 pm. Grizzlies have 2 more home games after Monday, when it's Fan Appreciation Weekend on April 6th and 7th against Idaho. Tickets are available now at the Maverik Center box office, utahgrizzlies.com or any Smith's Tix locations. You can hear tonight's game on ESPN 700 as well as see the game on ECHL.TV. Rapid City Rush at Utah Grizzlies. Monday March 18, 2019. 7 pm face-off. It's the final game of a 6 game in 2 city series between the two teams. Rapid City has already clinched the series win as they took each of the first 4 games of the series. Mike Economos had 2 goals and 1 assist and Mitch Maxwell and Teigan Zahn each had 1 goal and 1 assist as the Grizzlies defeated the Rush 5-2 at Maverik Center. Joe Cannata stopped 31 of 33 shots. Special teams contributed on all 3 goals in the 2nd period. Mitch Maxwell scored a short handed goal 7:01 into the frame. It was his 3rd goal of the season. Turner Ottenbreit got the assist. Utah scored on the power play 10:51 into the period as Gabriel Verpaelst scored his first goal for the Grizz this year, which was crazy because he got in a full fist fight in the first period but hey, as they say in hockey, let's do that hockey. The Grizz took the lead as Mike Economos came out of the penalty box and Taylor Richart hit him with a cross ice pass and Mike scored his 9th goal of the season and first of two on the night. Grizzlies penalty kill was a perfect 5 for 5 on the game. Saturday was Joey Ratelle's Grizzlies and season debut as he comes over from the AHL's Manitoba Moose. Ratelle is a dynamic hockey player who had 23 goals and 24 assists as well as 200 penalty minutes in 70 games for the 2018 Kelly Cup Champion Colorado Eagles. Ratelle is 22 years old. He played in the QMJHL for 5 season, with his best year coming in the 2014-15 season, where he had 33 goals and 19 assists. Walters had a 3rd period assist on Saturday. That was his 300th career professional point. Walters has 16 goals and 26 assists this season. He has 275 ECHL points, 10 AHL points as well as 15 points in Belarus. Cole Ully. He has 4 goals and 4 assists in 12 games vs the Rush. He has a point in 6 of the 12 games. Caleb Herbert has 3 goals and 8 assists vs Rapid City in 12 games this year. Special teams have been interesting vs Rapid City. In the first weekend of the regular season the Grizzlies were 5 for 13 on the power play. In the last 10 head to head games, Utah is 2 for 52 on the power play. Grizzlies are currently tied for 4th in the league with a 20.7% PP. Utah's penalty kill is 11 for 14 in the 4 games this series. Utah's power play is 1 for 21. A crowd of 9237 on Saturday night saw the Grizzlies win 5-2 over the Rush. It was the 2nd largest crowd of the season. Utah is currently 7th in the league in attendance at 5436 per game. If that total holds up it will be the 2nd largest average since the Grizzlies joined the ECHL 14 years ago. Utah has a record of 5-6-0-2 vs Rapid City this season. It's the 14th and final season meeting between the two teams. Cedric Montminy has been great for Rapid City this season. He leads the Rush with 17 goals on the season. He has 6 goals and 5 assists against Utah this season. Goaltender Adam Carlson is 8-2-0-1 vs Utah this year with a 1.84 GAA and a .946 save percentage. Goals against per game: 2.92 (tied 7th). Shots per game: 32.18 (11th). Shots against per game: 28.76 (4th). Power play: 20.7 % (4th). 1st Period Scoring: Utah 60 Opponents 53. 2nd Period Scoring: Utah 76 Opponents 59. 3rd Period Scoring: Utah 60 Opponents 61. Caleb Herbert is 5th in the league with 31 goals and is also 3rd in the league with 64 points. Herbert is 4th in the league with 24 power play points. Joe Cannata is tied for the league lead with 4 shutouts. Grayson Downing missed 8 straight games before returning to the lineup on Friday vs R.C. He missed Saturday's game vs Rush. Forward Austin Carroll has been out since January 30th. Caleb Herbert and JT Henke - 5 times. Tim McGauley, Austin Carroll, Julien Nantel, Eric Freschi and Mitch Maxwell- 1 time. Player of the Week: Matt Berry - November 19th-25th. Goaltender of the Week: Joe Cannata - November 19th-25th, October 12th-14th. March 18, 2019 - Rapid City at Utah. ESPN 700. March 22, 2019 - Utah at Allen. ESPN 700. March 23, 2019 - Utah at Allen. Classic Country 1370, 104.3 FM/HD-2. Thursday, March 14, 2019 - Rapid City at Utah. Rush win 2-1. Will Smith scored for Utah. Kevin Carr 24 of 26 saves. Saturday, March 16, 2019 - Rapid City at Utah. Grizz win 5-2. Mike Economos 2 goals, Mitch Maxwell and Teigan Zahn 1 goal 1 assist each. Joe Cannata 31 of 33 saves. Monday - Rapid City at Utah 7:00 pm - Maverik Monday, Buy One Get One Free Tickets With Maverik Adventure Card.